Hummingbirds on the feeders, motmots in the bushes, frigate birds over the beach: Tobago provides an exciting introduction to the pleasures of birdwatching in the tropics. Much of the enjoyment comes from the fact that the birds are both colourful and tame, and so easily observed. Even without binoculars it's easy to get fantastic views, or with a simple digital camera to take great photographs. From an ornithological perspective Tobago isn't part of the West Indies, for its avifauna is very much Venezuelan. This means that the variety of birds to be found on the island is considerably greater than any of the Caribbean islands of comparable size. 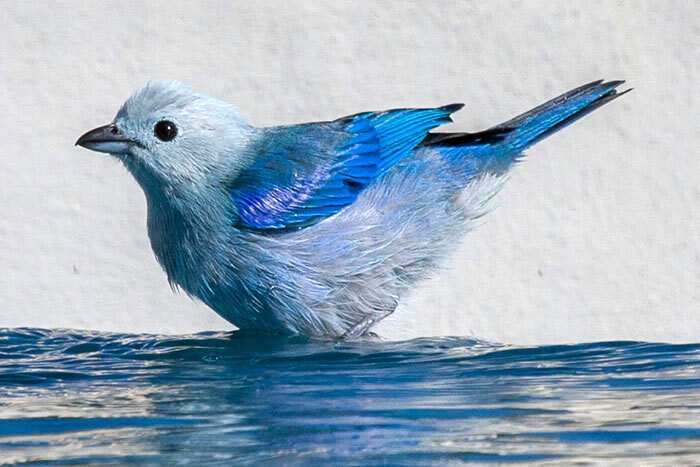 Only Cuba, which is 350 times bigger, can boast more birds. However, Tobago's big brother, Trinidad, has a far greater diversity of species than Tobago, and rather more than Cuba. To put this in perspective, a fortnight's reasonably intensive birding on Tobago won't produce much more than 100 species, but if you spend four days on Tobago and 10 on Trinidad you can expect to record around 200. 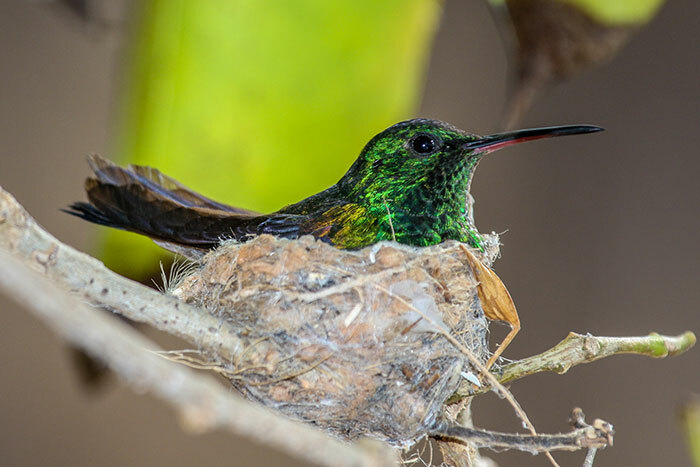 Over 400 species of birds have been recorded on Trinidad, of which around 250 breed, but Tobago's list is closer to 200, of which fewer than 90 breed regularly. These figures include a number of vagrant species that have only been recorded a few times. Thus, descriptions of Tobago as a birdwatcher's paradise are a little over the top. 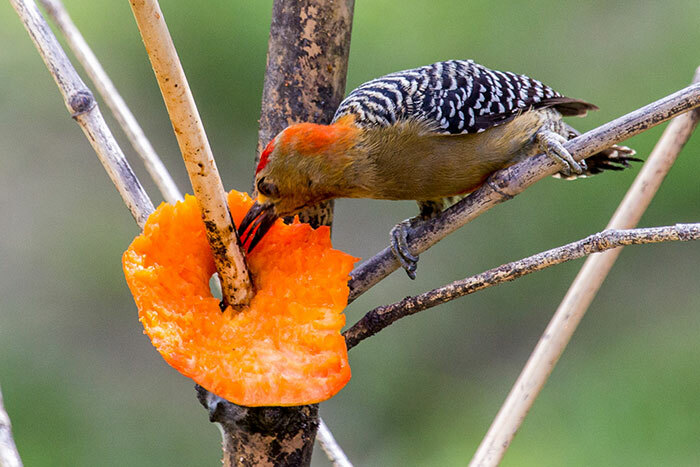 Serious birdwatchers relish the challenge of finding new birds and identifying difficult species: birdwatching on Tobago doesn't offer that sort of challenge. With a little help from an experienced local guide it's not difficult to see virtually all the potential birds that Tobago holds during just a few days. However, if you've never been to the Neotropics before Tobago does offer a wonderful introduction to many South American bird families without the risk of being overwhelmed by the sheer variety of species. 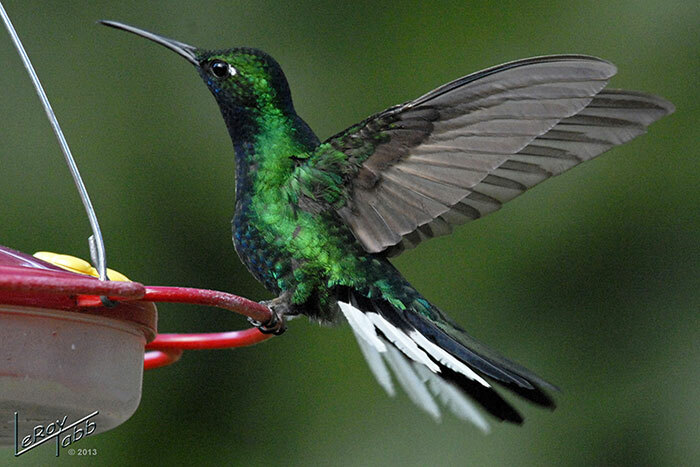 Six species of hummingbirds, for example, breed on the island, and it's not difficult to see them all. In contrast, Venezuela has nearly 100, including all six that are found on Tobago. 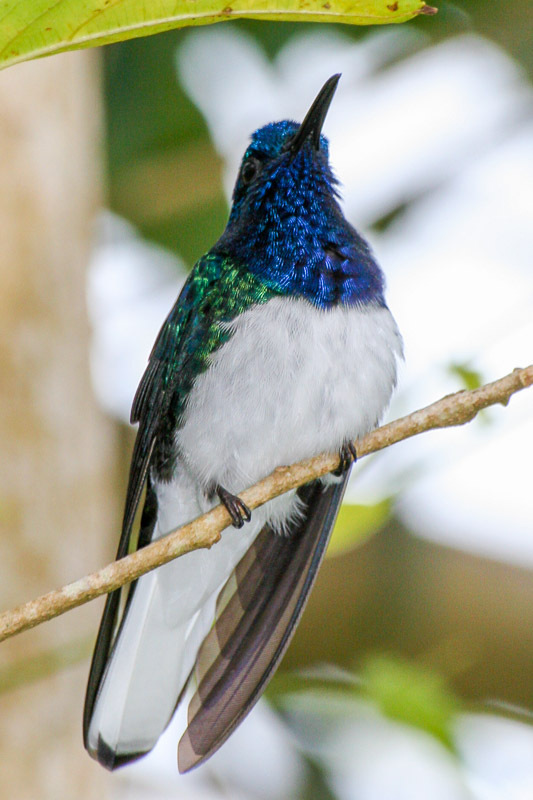 Intriguingly, Tobago's rarest hummer, the white-tailed sabrewing, doesn't occur at all on Trinidad and isn't easy to find in Venezuela. There are a number of other species in addition to the sabrewing that occur on Tobago but not Trinidad. They are the red-billed tropicbird, rufous-vented chachalaca, striped owl, red-crowned woodpecker, olivaceous woodcreeper, white-fringed antwren, blue-backed manakin, Venezuelan flycatcher, Caribbean martin, scrub greenlet, black-faced grassquit and variable seedeater. You might struggle to find the striped owl, but all the others are relatively easy to locate. 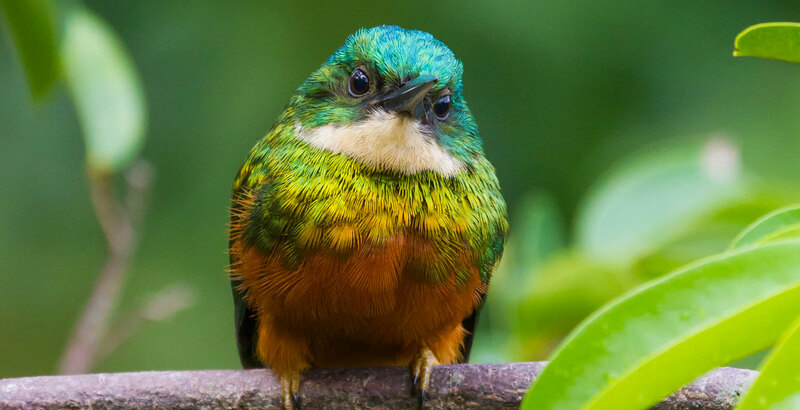 One of Tobago's advantages over Trinidad is the fact that a number of the most attractive species, such as rufous-tailed jacamar and blue-crowned motmot, are much easier to see on Tobago. A visit to Little Tobago is also a must for birdwatchers, as there's nothing like it on Trinidad. Here, from December to July, you can enjoy the spectacle of hundreds of red-billed tropicbirds soaring over their breeding grounds, and you can even see these delightful birds at the nest. There's no more elegant creature than a tropicbird, nor more effortless flier, so to visit Little Tobago is a treat for anyone interested in enjoying spectacles of nature. Incidentally, white-tailed tropicbirds have also been recorded regularly in recent years, though finding one among all the red-bills is a challenge. 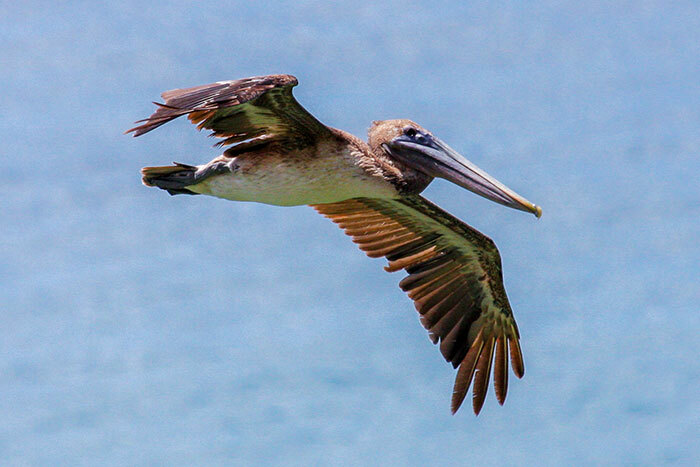 Little Tobago also offers the opportunity to see a number of other seabirds, including three species of booby. Though you have to be lucky so see the blue-faced or masked, you should see both brown and red-footed without any trouble. For many years Little Tobago was famous for its colony of greater bird-of-paradise, a native of New Guinea. Sir William Ingram introduced some 48 birds here in 1909. Though a nest was never found, the birds evidently bred successfully as the colony survived for many years. By 1979 just a pair remained, and extinction must have followed soon after. The secret of seeing the maximum number of birds on Tobago is to visit as wide a variety of habitats as possible. Unlike Trinidad, Tobago has no extensive marshes or lakes, no swamp forest and no mountain forest over 2,000ft, but there are small pockets of special habitats that are always rewarding. For waterbirds a visit to the sewage ponds near Pigeon Point is a must. Here you should see a small variety of ducks, including white-cheeked pintails, red-billed (or black-bellied) whistling ducks and blue-winged teal, though there is always a chance of finding an unexpected species. In December 2003 I saw three northern pintails here, the first record for the island. During the northern winter you can expect to see a variety of North American waders, including lesser and greater yellowlegs, willet and whimbrel, as well as the resident southern lapwing. It's a great place for herons, and eight species on a single visit is not unusual. Look carefully to see both little and the closely related snowy egrets. The former, a recent arrival on the island, is best identified by less yellow on the legs than the snowy, as well as black rather than yellow lores (the bare skin around the beak and eyes). The mangroves between the pools and the sea are a productive area to look for wintering North American warblers, and with luck you might find prothonotary and yellow warblers here, along with a variety of flycatchers. 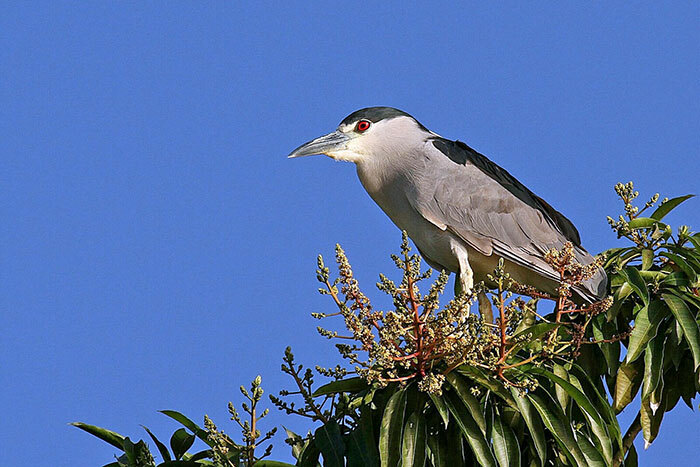 Look out, too, for mangrove cuckoos. This is also a reliable site for the curious smooth-billed ani. The pools, close to the Magdalena Grand Beach & Golf Resort, are the largest freshwater lakes on the island. Ask permission before entering, then look for more wildfowl and waders. You should see least grebes and anhingas (the so-called snake bird or water turkey), neotropical cormorants and moorhens (the same as we have in Europe). This is a good site for yellow-headed caracara, a new addition to Tobago's list of breeding birds and now increasing. Grafton Bird Sanctuary has long been famous as one of Tobago's premier birdwatching sites, and it remains so today. 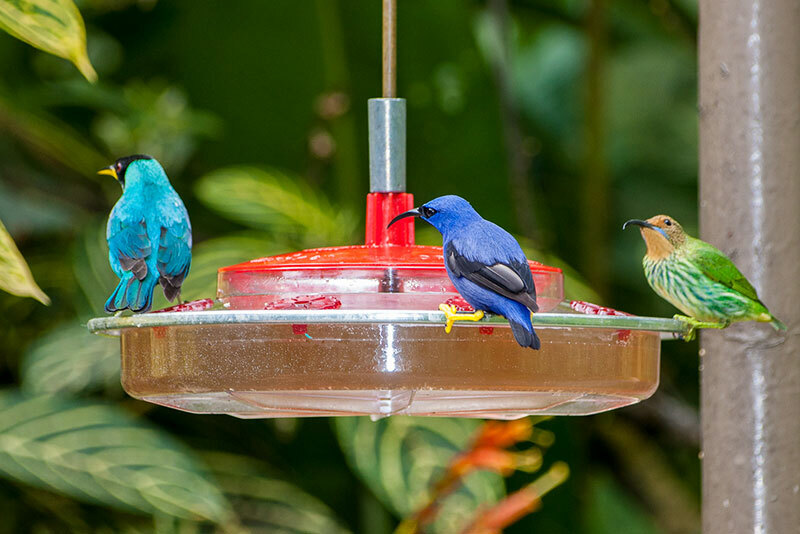 Crowds of birds are attracted to the feeders, and it's a great place for getting good views of chacalacas, a variety of doves and tanagers, and motmots coming to the feeders. Red-rumped woodpeckers – the hardest to find of the three species found on Tobago – can also be seen here. Walk the trails and you should be rewarded with good views of white-fringed antwrens, scrub greenlets and orange-winged parrots, with soaring broad-winged hawks overhead. It's always worth checking out any promising habitat for birds. Not far from Grafton, at Turtle Beach, you will find a small freshwater lagoon behind the southern end of the beach. Here, if you're lucky you might find spotted and solitary sandpipers, possibly both belted and green kingfishers, as well as green herons. 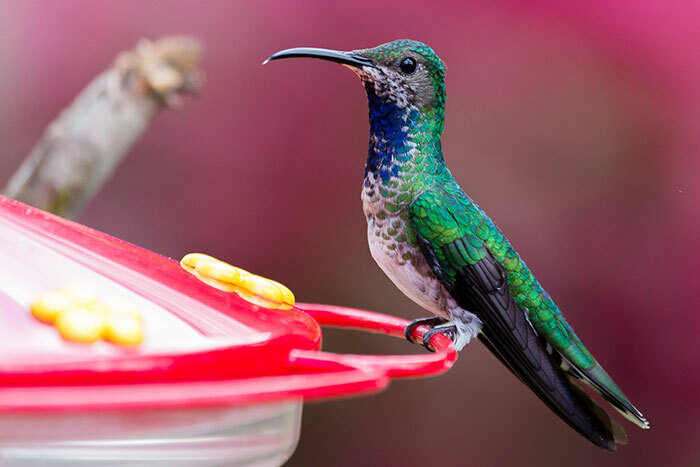 Many of the hotels hang out sugared water to attract hummingbirds. 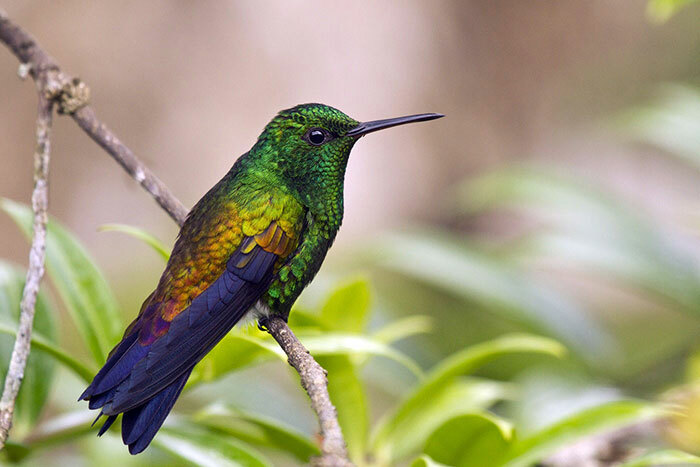 Five species of hummer can be seen here, Copper-rumped is the most common, but look out for the ruby-topaz, as spectacular as it names suggests, and the beautiful white-necked Jacobin. Arnos Vale is an area rich in birds (but you can find a similar selection elsewhere – it's just an easy place to look for them). Watch out for barred antshrikes, cocoa woodcreepers and bare-eyed thrushes, along with blue-grey, palm and white-lined tanagers. During the northern winter northern waterthrushes are easy to find along the streams. The name is misleading, for these attractive birds are really North American warblers, not thrushes. Sitting on the beach watching the sea for birds is a pleasant way to spend the hottest part of the day. Magnificent frigatebirds are numerous and impossible to miss, along with brown pelicans and laughing gulls, but you should also see both royal and Sandwich terns. Ospreys breed on Tobago; numbers increase in the winter when the residents are joined by migrants from the north, so they are quite common. You can watch them fishing anywhere around the coast. 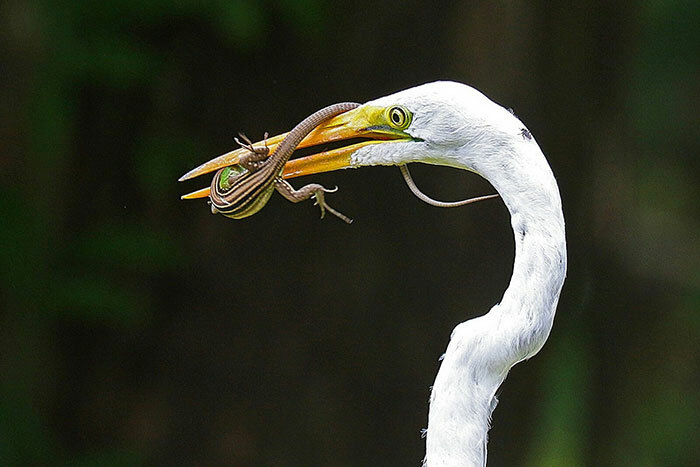 Look out, too, for yellow-crowned night herons. As their name suggests, they are most active at dusk and on into the night, but they can often be seen during the day. If you're lucky you might see flights of Audubon's shearwaters skimming the waves, but brown boobies are much easier to spot. Certain birds are common almost anywhere on the island. Yellow and black bananaquits are always tame and approachable, while there are four species of doves that are commonly encountered: pale-vented pigeon (the biggest species), ruddy ground dove, white-tipped dove and the diminutive eared dove. Tropical mockingbirds are bold, confident birds that also sing well, while look out too for both tropical and grey kingbirds and house wrens. 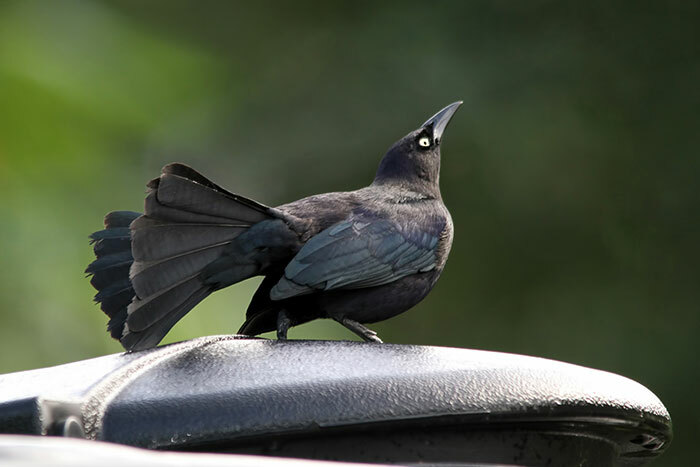 There aren't any crows or starlings, but Carib grackles are rather starling like, and giant cowbirds do look like small crows. Overhead, watch for short-tailed swifts and Caribbean martins. 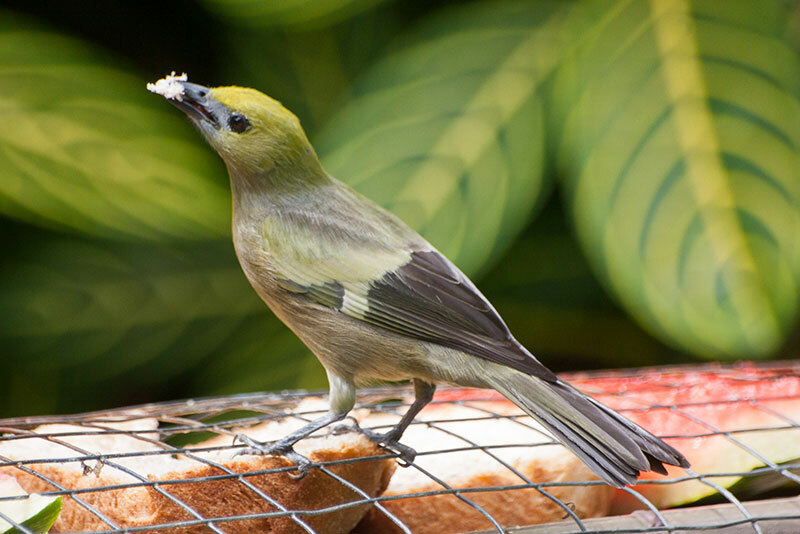 A must on any birdwatcher's itinerary is the Main Ridge, a luxuriant, evergreen rainforest. This is the coolest part of the island, so you might need a sweater or, equally likely, a raincoat, for your visit. A walk along the trail here will give the opportunity to see a number of species that can't be found anywhere else on the island. 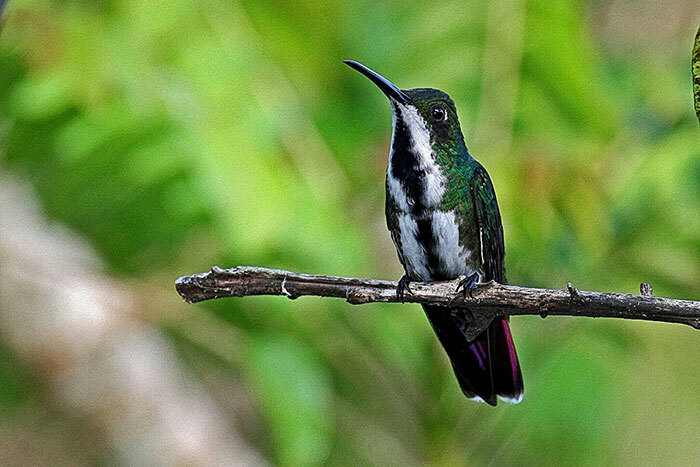 Some, like the white-tailed sabrewing hummingbird, are relatively easy to see, but others are more difficult. It takes time to spot your first collared trogon, as these beautiful birds tend to sit quietly and not draw attention to themselves. Look out, too, for yellow-legged thrushes that look remarkably like European blackbirds, along with olive-green woodpeckers and blue-backed manakins, the latter an absolute stunner. 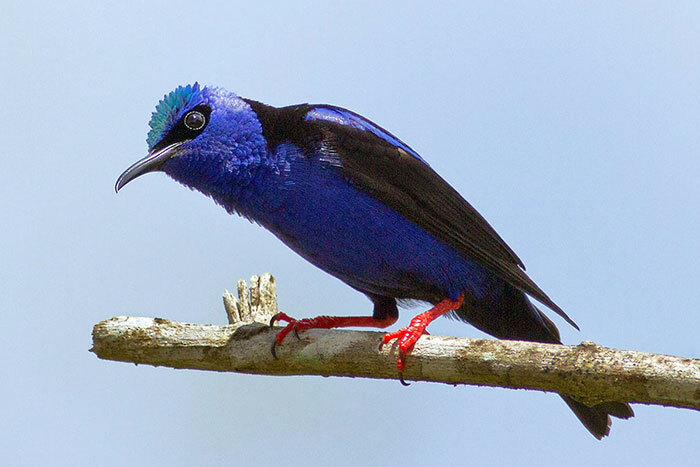 Without a guide you might well struggle to find, let along identify, some of the less obvious species such as streaked and fuscous flycatchers, but there's no mistaking the handsome red-legged honeycreeper or the exquisitely named violaceous euphonia. One of the hardest birds to find is the tiny white-throated spadebill, an inconspicuous and solitary flycatcher. One of the great advantages of venturing into the forest with an experienced local bird guide is that he (I'm unaware of any female guides) should know all the calls and songs, which makes finding birds so much easier. He will also know from experience what birds should be where, and will almost certainly know of a fruiting tree that's currently attracting birds. If you've got plenty of time and patience, and are a practised birder, then you will probably be able to find your own birds, but if time is limited, book a guide. 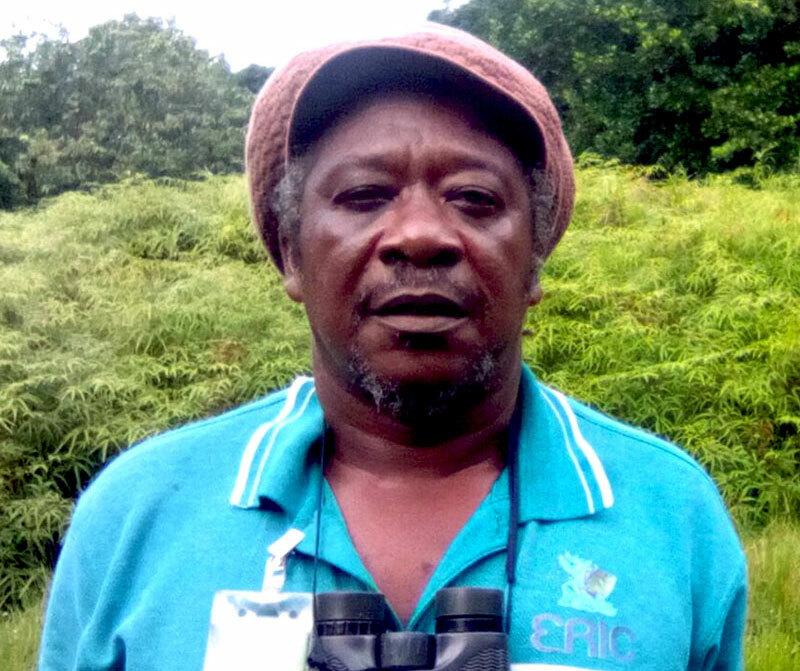 A good guide may also produce an unexpected bonus: on my last trip my guide, Newton George, showed me a roosting common potoo that I would never have found otherwise. The best plan is arguably to take a guide for your first visit to Main Ridge, but then go back again and explore by yourself. Birding from the road is often productive, stopping regularly wherever there is a good view or if you see an interesting bird. The drive up to Main Ridge from the east coast is particularly productive. From the top of the ridge watch for soaring raptors: you should see the impressive great black hawk, which is in fact more numerous than the very similar common black hawk. If you see a small, buzzard-like raptor then it's most likely a broad-winged hawk; this species is resident on Tobago. Look out for merlins. Though the same species as the birds that breed on our moors, it's not unusual to see them on Tobago hunting in clearings in the rain forest. They are fairly common winter visitors from North America. Frustratingly, Tobago doesn't have an up-too-date bird book that's easy to use. Most birdwatchers buy (and struggle with) A Guide to the Birds of Trinidad and Tobago, by Richard ffrench. Sadly, the illustrations are poor and not a great help to identification, while most migrant North American birds are simply not illustrated. It was a reasonable guide when it was first published, but that was over 30 years ago. A useful compromise is to carry Helm Identification Guides: Birds of the West Indies by Herbert Raffaele, despite the fact that it doesn't cover all the birds you might find on Tobago. Couple it with the Birds of Venezuela by Steven Hilty and you should be able to identify everything you encounter. Equipment? Binoculars are essential, while a telescope is extremely useful, preferably with a wide-angle lens rather than a zoom. I find a 20x eyepiece ideal in the rain forest, as it provides a wide field of view and lets in lots of light. Many birds are tame so relatively easy to photograph. If you are a skilled digiscoper (taking photographs through your telescope) then you are sure to have lots of fun on Tobago. Though you can hire wellington boots to walk in the rain forest, the mud is seldom deep, and in my experience, you can easily get away with decent walking boots. Insects are unlikely to be a major problem, while I can't recall encountering any leeches. Be warned that the top bird guides, such as Newton George, do get booked up well in advance, so it pays to arrange your guide well before you arrive in Tobago. Though the best guides on Tobago aren't cheap to hire, especially compared with other tropical destinations, they will enhance your birding experience by telling you so much more about the natural history of the island apart from just finding you the birds you want to see. Do get alternative quotes for your boat trip to Little Tobago, and make sure that your boatman gives you sufficient time to really enjoy your visit. Anything less than three hours is unlikely to be enough. 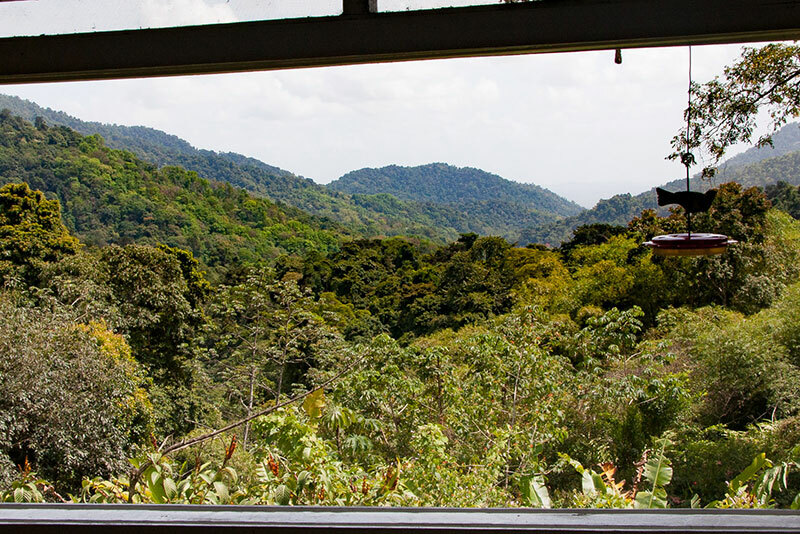 If you are serious about your birds, then arranging a two- or three-night visit to Trinidad, staying at Asa Wright, is an attractive option that isn't expensive. It will give you the chance to see a good number of species that don't occur on Tobago, such as the spectacularly noisy bearded bellbird and the channel-billed toucan. 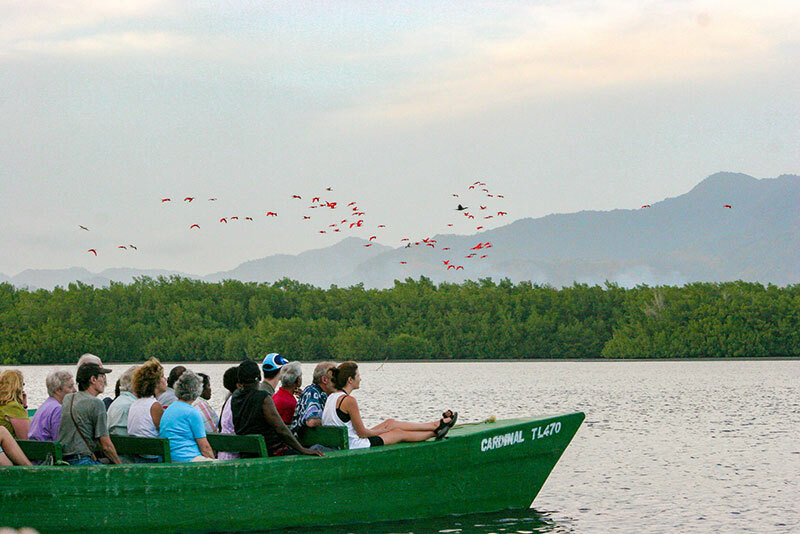 Be sure to include a tour of Caroni Swamp: the spectacle of hundreds of scarlet ibises coming in to roost is not to be missed. We extend our appreciation to David Tomlinson for the above article. David is a professional writer on birds who organises and leads overseas birdwatching holidays for his company, Gourmet Birds. 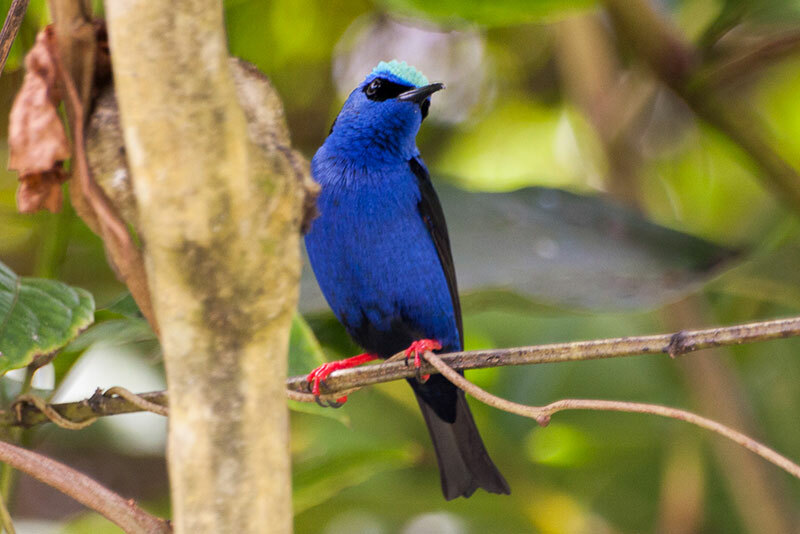 Tobago's stunning bird life is such a major component of the visitor experience that almost every guide on the island tends to claim ornithological expertise. Although most of these will tend to know more about Tobago's natural history and birdlife than the average tourist, it is easy for the unwitting visitor to be misled by someone with little more than a nice line of chat. Serious bird watchers will wish to consider the guides listed on this page. 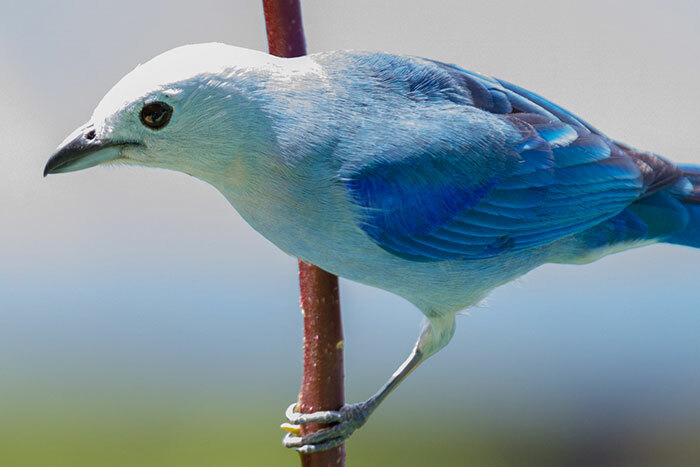 These are Tobago's top bird watching guides. They are widely acknowledged as the island's leading birding experts. 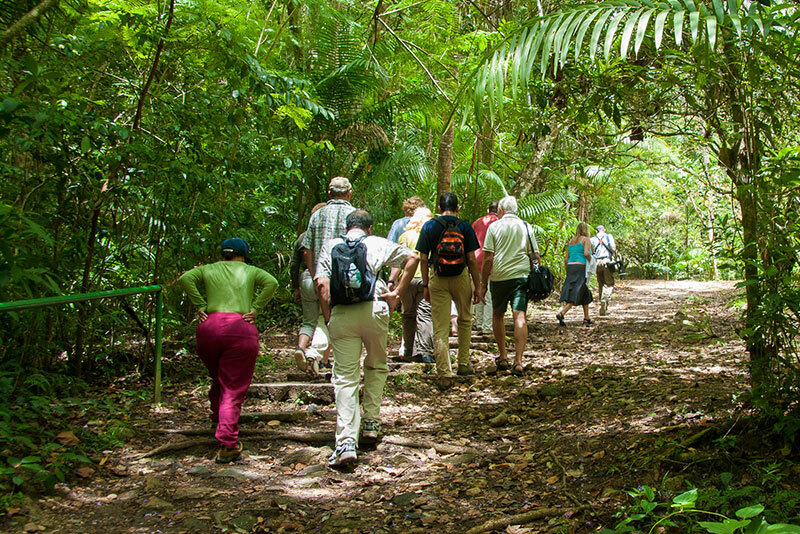 Their knowledge and expertise extend across the flora and fauna of the island and Tobago's natural history. Their services are much in demand, particularly during the January to April high season. So, it is essential to book early to avoid disappointment. Other guides are listed in our main listing of Tour Guides and in our Business Directory. Few would disagree that Newton George is Tobago's premier bird watching guide. 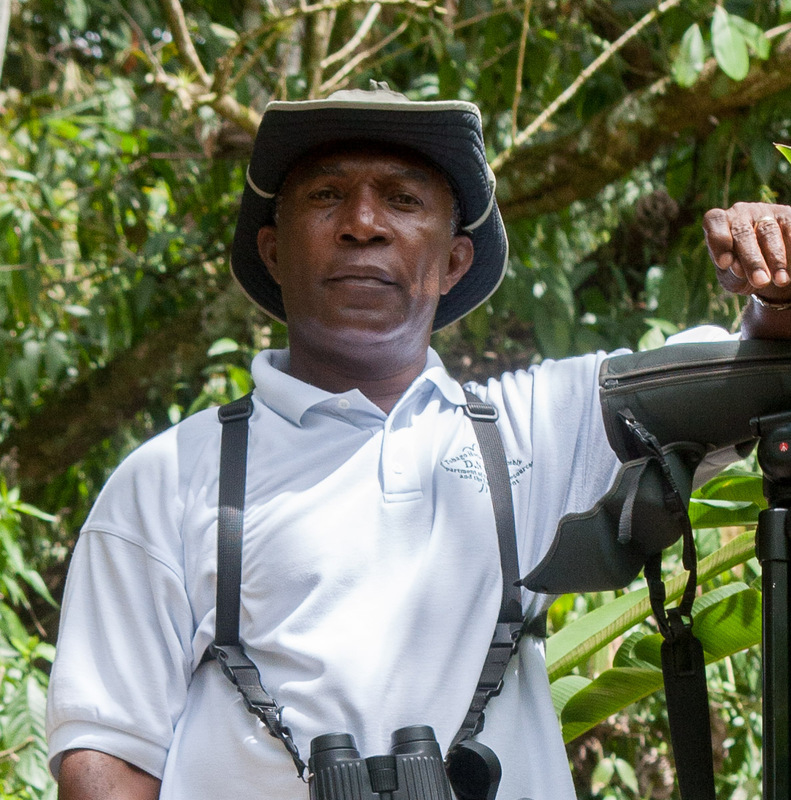 With more than 32 years of experience as an official Rainforest Ranger and more than 15 as a full-time birdwatching guide, Newton's knowledge, experience, and dedication to Tobago's environment are beyond question. Equally importantly, those who have been on a tour with him invariably comment on what a lovely guy he is. If you're going to spend the best part of a day in the company of a guide, how much more rewarding the experience if it's in the company of someone you like, as well as respect. 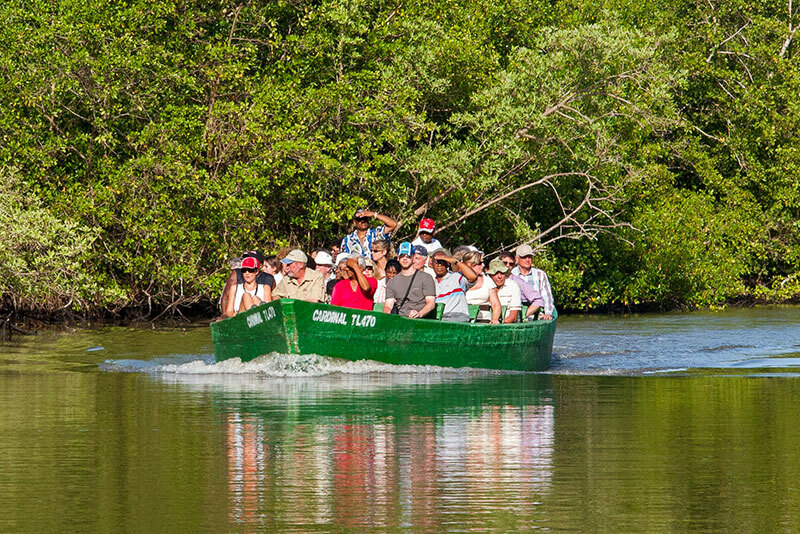 In addition to full and half-day bird watching tours to the rainforest and Little Tobago, Newton offers full island tours and one-day excursions to the Asa Wright Nature Centre and Caroni Swamp in Trinidad. Although we are not serious bird watchers ourselves, we have hugely enjoyed the two tours we have undertaken with Newton. Full reports of these are available in the Newton tab above. 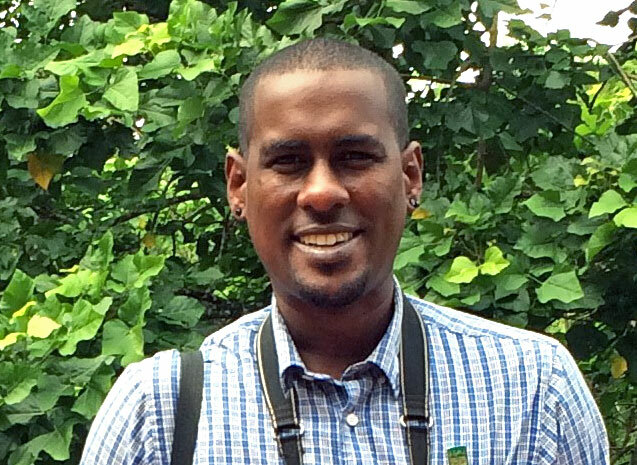 Following in the footsteps of his father Adolphus, who was Tobago's most senior and respected birding guide for many years, Gladwyn James has inherited his father's passion and commitment for the island's birds and natural history. 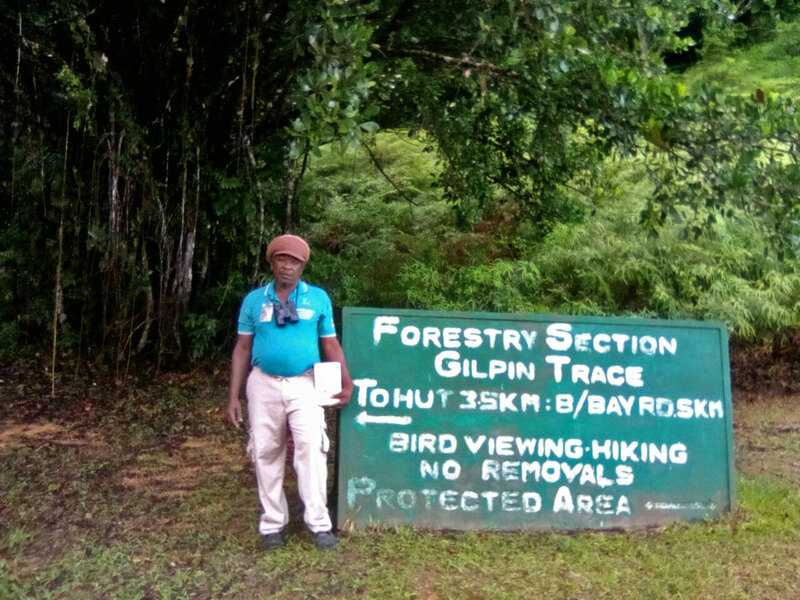 Gladwyn has been conducting birdwatching tours for more than twenty years and offers tours across the wetlands, parks and forest preserves of Tobago. He primarily operated via a specialist birding tour service in Trinidad, but since October 2017 has been operating independently. Gladwyn has qualified as a Certified Interpretive Guide and has a 20-seater bus, having primarily worked with larger birding parties over recent years. Kelton's love of birds began as a boy when his father, a keen outdoorsman, would take him on hunting and fishing trips across Tobago. After leaving school, Kelton became a tour guide before moving to England in the early 1990s, where he did a 3-year course in falconry and raptor management at Leeds Castle. 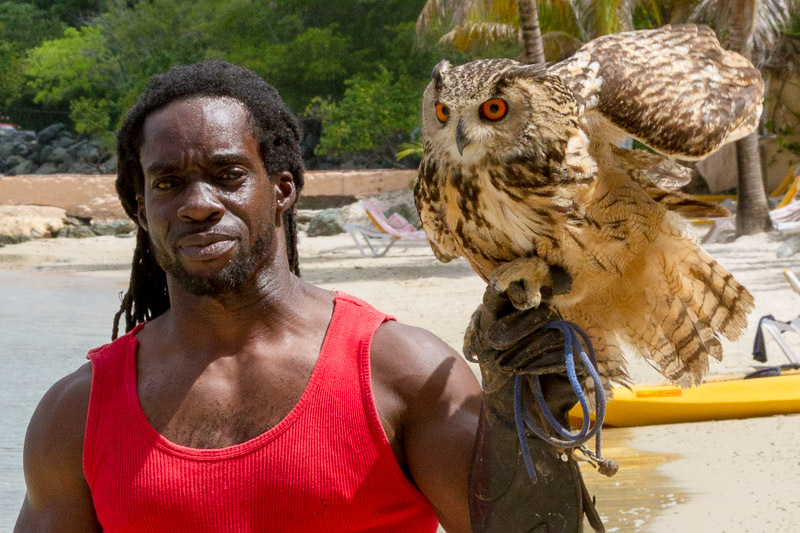 He returned to Tobago in 2005 and continued his guiding services whilst setting up the Tobago Birds of Prey Rescue and Rehabilitation Centre. His rescue centre is not yet open to the public, but Kelton offers private bird watching tours which can include a visit to his raptor centre. 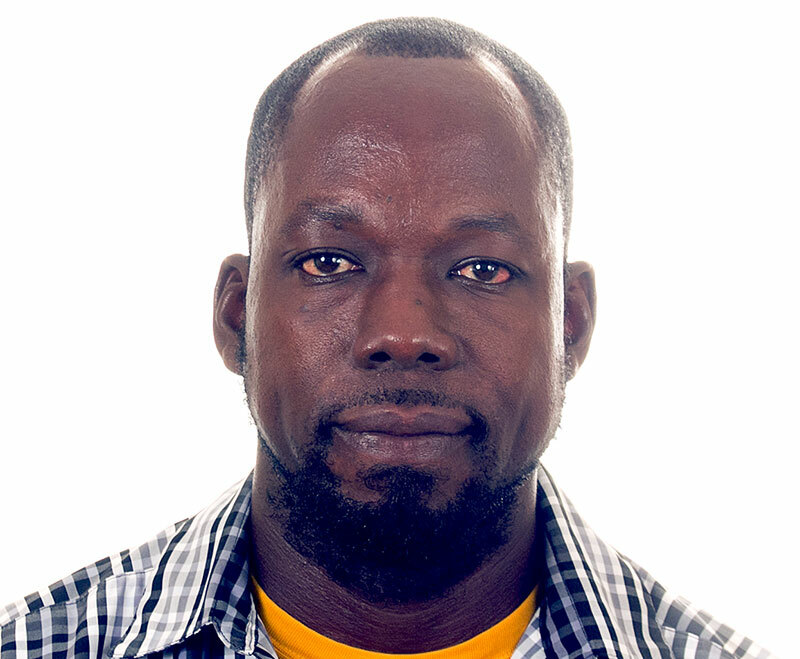 Jason is one of Tobago's best known and most respected naturalist guides, with experience spanning more than two decades. He trained at the world-renowned Asa Wright Nature Centre in Trinidad, where he became Senior Naturalist, before moving into hotel management in Tobago. He has now opened his own business, Eureka Natural History Tours, and offers a variety of birdwatching, nature and turtle-watching tours, plus detailed general interest and historical tours. He is an experienced and knowledgeable guide and an excellent communicator, so deserves to be high on any visitors guide shortlist. 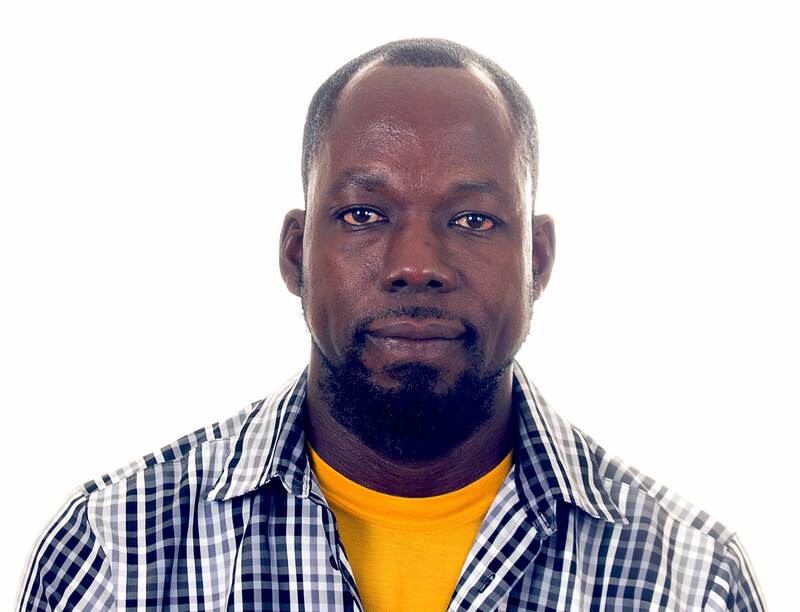 Darren is a trained forester, possessing a diploma in tropical forestry and certificate in tropical dendrology. He has a keen interest in avifauna, plant life and the environment. 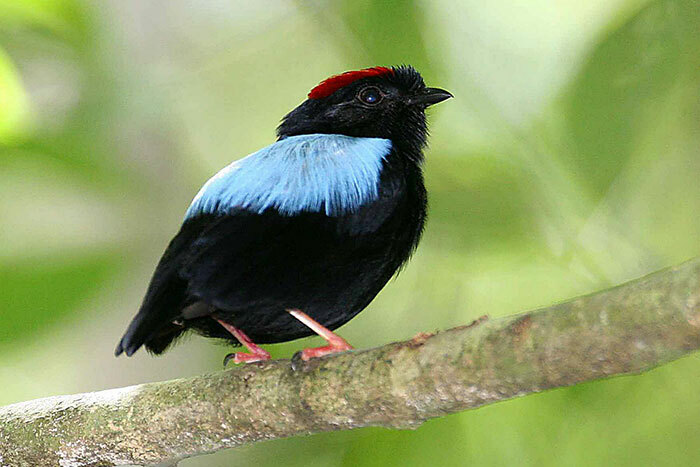 He is an experienced guide in birding and rain forest tours. 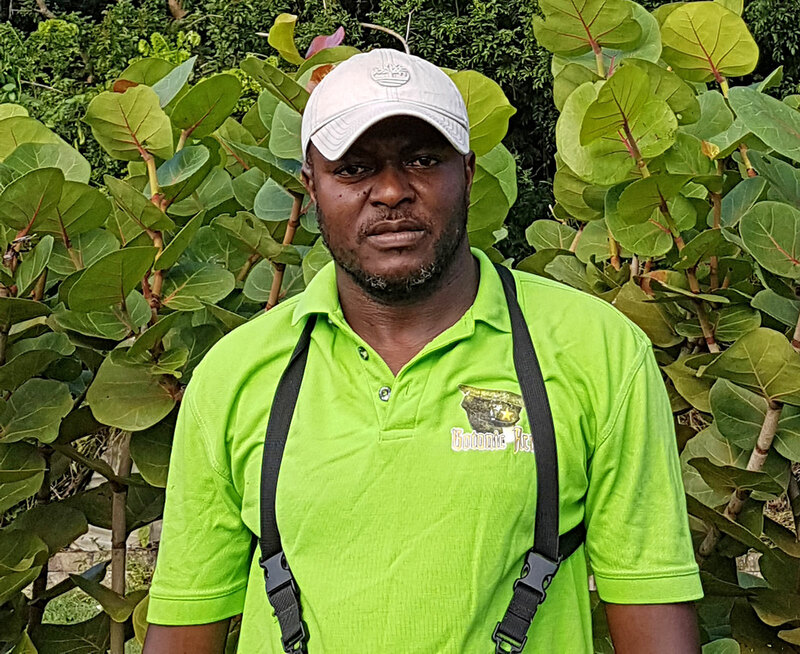 He assists the Tourism Department by conducting lectures on Tobago's Flora and Fauna to tour guides, taxi drivers and schools. Darlington is an experienced and popular guide. Based at Bloody Bay, he understandably makes much of the fact that he and his family have lived on the edge of the rainforest for generations and therefore know the area and wildlife intimately. Like all the guides, Darlington offers collection and return to any hotels or visitor accommodation on the island and a variety of standard or bespoke tours. 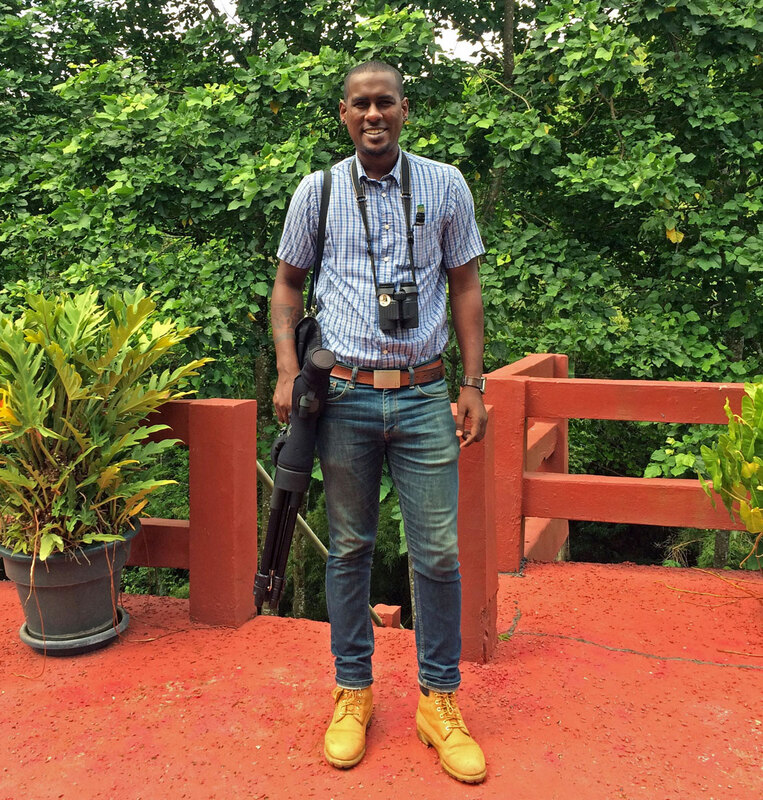 Randy is an up-and-coming Tobago birdwatching guide being mentored by Newton George. He is highly recommended for visitors to Speyside who would like to enjoy a birdwatching tour on Little Tobago. We first published this review in early 2003. The beautiful birdlife has always been a highlight of every holiday we've enjoyed on Tobago, but we are not serious birdwatchers. However, we had undertaken extensive research for the birdwatching section of this website and taken expert advice to identify the leading birdwatching guides. The clear consensus was that Newton George was the man to watch. At that time, he was a full-time employment rainforest ranger and only conducted birdwatching trips in his spare time. Mention the name 'Newton' to anyone on Tobago today and they will automatically know who you are referring to. He is acknowledged by international birding experts as Tobago's leading ornothological guide. Although old, I am including the report largely for sentimental reasons and because it might offer first-time visitors a glimpse of the joys to be had in the company of a top guide. Our report on a subsequent trip with Newton to the wonderful Asa Wright Nature Centre and Caroni Swamp are availabile in the Trinidad tab. 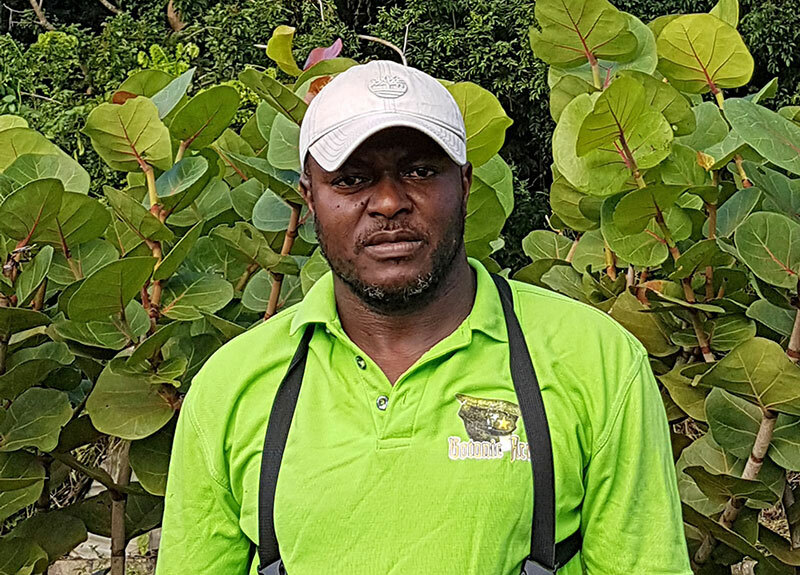 Newton George was one of Tobago's two official Rain Forest Reserve Rangers until he retired in 2004 to offer guiding services full-time. As a Ranger, his job was to police and protect the oldest protected rainforest in the western hemisphere. With more than half a century of experience, Newton's credentials are without question. Amongst many claims to fame, he has been featured on the BBC's Holiday program and created the Red Billed Tropic Bird viewing site on Little Tobago featured in David Attenborough's popular Trials of Life television documentary. Having identified Newton as Tobago's premier birding guide, we were keen to put his skills to the test. We had been introduced to him during a stay at the Blue Waters Inn (one of Tobago's best birding bases), so knew him to be a charming and likeable fellow. But what was he like in the field? Well, never having been on a formal birding tour, neither Jill nor I were in any position to cast opinion on Newton's ornithological skills. Yes, Jill had put considerable effort into research for her introduction to our birdwatching article, but both of us were birding virgins. Not so one of our party; my sister's companion, Chris, was an enthusiastic amateur birder with extensive experience. It was Chris who would be the principle judge on our field trip and who would determine our final evaluation. Two evenings before the allotted tour, I telephoned Newton to finalise details. Newton was excited. He had identified a bird not previously seen on Tobago and was keen to try and find it again. It would be a wonderful piece for our article. Sadly, this was not to be. We had just returned, that very day, from a long an exhausting trip up the coast and across the Main Ridge rainforest to Charlotteville. This is a beautiful journey and a 'must' for every visitor. However, it is NOT a journey to be attempted in a Suzuki Carry with six passengers boasting a cumulative age of 380 years. In fact, it is not a journey to be attempted in a Suzuki Carry with ANY passengers. The last thing we wanted was to put a dampener on Newton's obvious enthusiasm. Nobody knows Tobago's rain forest better than Newton. The forest is HIS preserve. But, the thought of making that long journey twice in three days was a more than we could contemplate. There was another factor. We wanted to take Newton out of his comfort zone and see what he could do in territory that he was less familiar with. So, we gave him a simpler brief: show us the birdlife within a fifteen-minute drive of Tobago's major hotels, in the flatter more urban part of Tobago. Newton was disappointed, but quickly rose to the challenge. Our impression that Newton might just be a rainforest guide was quickly disproved. It quickly became obvious that he had intimate knowledge of every part of Tobago and was as much at home in the flatlands around Crown Point as he was in the northern ranges. Promptly at 7am, three members of our party jumped into Newton's car and headed down the coast towards the built-up areas. Now, I do not propose to offer a detailed review of our entire trip. Serious birders would probably consider it an insult and others would simply switch off. I can only say that we experienced a truly wonderful and enjoyable morning. Newton proved to be a wonderful guide and companion. His commitment to conservation and the preservation of Tobago's wildlife are patently obvious. As much as I love and admire birds and natural history, I did have some concern that I would find a full morning on the subject a trifle boring. Not a chance! Newton made everything so interesting. It was impossible not to be captivated by his obvious enthusiasm. It was very clear that Newton isn't simply a paid guide conducting tours for commercial gain. He lives and breathes Tobago's birdlife and natural history. This was aptly demonstrated in the way that he shared knowledge with anyone we met along the trails, including other tour guides. Our first port of call was the Grafton Caledonia Bird Sanctuary. The drive from Arnos Vale would normally take around fifteen minutes. Our journey took three times that. We must have stopped every half a mile for Newton to point things out. It is fortunate that driving standards in Tobago are, shall we say, 'relaxed'. Newton's habit of pulling into the side of the road without warning would cause major road rage in Britain. It is fortunate that this is normal on Tobago and that everyone drives accordingly. I had visited the Grafton Caledonia Bird Sanctuary before and found it a pleasant diversion, but little more. It is not a place that I would visit on a regular basis. Newton changed all that. We spent around an hour and a half walking around a lovely cool trail, shaded by thick foliage - a trail that I could have covered in less than fifteen minutes on my own. It was impossible to walk more than ten metres without Newton stopping to show us yet another species of bird. Even more fascinating was Newton's ability to communicate with the birds. If we didn't see a bird for a few minutes, he would simply call one. I kid you not! It was often difficult to tell whether the calls were from Newton or the bird, but most were two-way, so who was fooling whom? The trip around the Grafton Caledonia clearly demonstrated the benefits of birding with an experienced guide. Based on my previous visits, the sanctuary was not a place I would particularly recommend. Newton totally changed my opinion and proved that it is not simply a "reasonably interesting place to visit" but a fascinating habitat for a very wide range of birds and wildlife. From the Grafton Caledonia, Newton took us down to the sewage works of the Hilton Hotel (now Magdalena Grand Beach & Golf Resort) on the Tobago Plantations estate in Lowlands. The artificial lakes and wetlands of this area are rapidly becoming an important and significant habitat and breeding ground for migratory ducks and birds. Finally, and taking my tour brief to heart, Newton completed the tour by taking us into Bon Accord and proving that a wealth of bird life can be found even in the built-up areas. Some five hours after collection, we returned to Arnos Vale. It had been a fascinating morning. With a chilled fruit punch in one hand and a pencil in the other, I joined Newton and Chris as they studied the sighting list. I was truly astonished. In a little under five hours we had identified 53 species of bird –a different species every five or six minutes. This represented nearly 25% of all the species to be found on Tobago and, staggeringly, all within a 15-20-minute drive of every major hotel on Tobago. Newton was obviously delighted by our satisfaction, but being the gent that he is, he refrained from commenting that we might have had a much higher and more interesting count had we allowed him to take us to his beloved rainforest. Speaking as an experienced amateur birder, our friend Chris could not rate Newton highly enough. Speaking as a non-birder, I can only say that I had a thoroughly enjoyable and informative morning with an obviously knowledgeable and personable companion. I exaggerate not when I say that a tour with Newton George will transform the way you see the island. I strongly commend his services to every visitor to Tobago. Now, I have never claimed to be a 'proper' birdwatcher and equally, have am not an early riser. Come on! We're supposed to be on holiday. I don't know which would have been the worse – Jill's reaction if I set the alarm clock for 3:15am, or having to get up at that time. "How about you pick us up at 6:30?" I said. Polite as ever, Newton consented. He probably rolled his eyes and thought me a total wimp. He's got his eye stuck to a scope by that time most mornings, with half a dozen 'proper' birders in tow. Anyway, this wasn't a 'working' tour. It was a private day out - just Newton, his lovely wife Dianne, Jill and yours truly. So, two days later Newton and Dianne were patiently waiting for the bleary-eyed duo as we emerged from the Blue Haven Hotel. By 7am we were checked in and enjoying breakfast at the terminal café before an uneventful 25-minute flight over to Trinidad. The Asa Wright Nature Centre is located on the Spring Hill Estate, some 1,200 feet above sea level, and in the centre of the Northern Range hills on Trinidad's northern coast and which rise to 3,000 feet. The drive from the airport took an hour. Once we entered the twisty country roads north of Arima and started ascending the Northern Range, the scenery became increasingly beautiful. The road passes a christophine farm - a popular local vegetable more commonly known as Chayote squash. Many acres of land are covered in net, six feet or so above the ground. The crop hangs from the nets, making for easier harvesting. The fact that the farm is surrounded by clusters of Hindu prayer flags makes the place even more intriguing to us visitors from northern climes. The Spring Hill Estate was originally a cocoa, coffee and citrus plantation. The plantation fell into neglect and shortly after World War II was bought by an Englishman, Newcombe Wright, and his Icelandic wife, Asa. They were keen amateur ornithologists and became close friends of American explorer and naturalist William Beebe, who purchased the adjacent plantation. Beebe named his plantation Simla and established a tropical research station for the New York Zoological Society there. The Wrights played host to the many naturalist and birdwatchers who visited the research station. Following Newcombe Wright's death, American wildlife artist, Don Eckelberry, and conservationist, Emma Fisk, led efforts to buy the 200-acre estate and convert it into a community-outreach centre. Asa agreed, on condition that the estate remained a conservation area in perpetuity. A non-profit trust was set up in 1967, under local and international management. The Asa Wright Nature Centre was born. The indomitable Asa Wright lived on the estate until her death in 1971. The aim of the trust is to protect the Arima valley and to create a conservation and study area. A substantial part of the trust's income is set aside for land acquisition. The Centre now owns some 2,000 acres of land in the Arima and adjacent Aripo valleys. The plan is to allow most of this land to be reclaimed by secondary forest. Over 150 species of bird have been recorded at Asa Wright. Serious bird watchers will undoubtedly wish to consider a stay at the Centre's back-to-basics 24-room lodge. Guests staying for three-days or more are granted a visit to the famous oilbird (Steatornis caripensis) colony in nearby Dunston Cave. Normally only found in northern areas of South America, access to these nocturnal birds is strictly controlled and is not available to normal day visitors. Activities at the Centre revolve around the wonderful refurbished plantation house, which acts as tour centre, bar and restaurant and houses some of the lodge's rooms. The gallery of the plantation house provides wonderful panoramic views over the Arima valley. More importantly, it is also a fascinating place from which to study the countless birds that constantly visit the regularly-replenished feeders beneath the gallery. The experience is not confined to birds; agoutis and a large golden tegu lizard were present during our visit, attracted by the rich pickings left out for them. Despite our late departure from Tobago, the timing of our arrival at the Centre seemed perfect. No sooner had we finished a refreshing drink at the bar than staff asked guests to assemble for the morning walk. The Centre offers two guided walks per day – one at 10:30am and one at 1:30pm. The cost is included in the entrance fee. Our guide, Harold, proved both knowledgeable and personable. The tour party consisted of a mixed bunch of around 16-18 tourists. Before setting out, Harold gave an introductory talk and established our levels of expertise and interest. He pitched the pace of the walk and the chat accordingly, and hit a perfect balance. The trails were easy and one would have to be very unfit to find the going too harsh. In fact, it was a pleasant walk suited to people of all ages and fitness levels. Hiking boots or similar are certainly not a prerequisite and the temperature in the shade of the trees was surprisingly comfortable. The walk lasted around 90 minutes and couldn't have been more enjoyable. When it comes to bird watching on Tobago, Newton George may be "the man", but how does he fare on Trinidad? Well, it was fascinating to see the obvious respect for Newton displayed by the staff at the Centre (we observed the same at the Coroni Swamp). It was equally satisfying to see the respect that Newton reciprocated. Harold was a damn good guide, but maybe didn't have quite as sharp an eye as Newton, or his obvious experience. With Harold at the front of the party and Newton at the rear, we had a wonderful combination. I have nothing but admiration for the quiet way in which Newton could draw Harold's attention to something he had spotted, or provide additional information, without in any way subverting the tour leaders authority. Harold clearly appreciated this and would regularly turn to Newton to ask his opinion, or invite him to comment. I always get immense pleasure watching professionals at work – whatever their field of expertise. Every member of the party benefited from the shared skills of Harold and Newton. This article is not intended as a field guide for birdwatchers. It is simply an overview of a day-trip from Tobago intended to help readers decide whether it is something they might wish to consider. So, I will not attempt to provide a detailed list of the birds we saw during the day. I would, however, mention the fascinating tree porcupine that Newton spotted, much to everyone's pleasure. Although the walk had been gentle enough, it had been an early start and a long morning. We were therefore looking forward to lunch when we arrived back at the Plantation House shortly after midday. Newton had promised us a fabulous meal and he was not wrong. The catering at the Asa Wright has an excellent reputation. I was disappointed when we entered the dining room. I am not a fan of buffet catering. My fears were unfounded; it was the best Caribbean food I have tasted since staying at Tobago's wonderful Cuffie River Nature Retreat. Lunch was a leisurely experience. Rather than small individual tables, the restaurant has several large communal tables. It was a wonderfully social experience with the mixed party of diners sharing experiences. The problem was getting the food down between gaps in the conversation. After lunch we returned to the main gallery and sat in virtual silence, lost in the peace and tranquillity of the Centre and the continual procession of birds at the feeders below. I could have relaxed there all day. Sadly, time passed more quickly than I would have liked and it was soon time to bid farewell to this magical place and make our way towards the Caroni Swamp. The 20 square mile Caroni Swamp is the largest mangrove wetland in Trinidad. It lies just south of the capital, Port of Spain, on the island's western coast. This is where the Coroni River joins the Gulf of Paria that separates Trinidad from Venezuela. The swamp is home to some 200 avian species. The most famous inhabitants are the Scarlet Ibis (Eudocimus ruber), Trinidad's national bird. During the day they feed in Venezuela, 11 miles away, returning to Trinidad at dusk – a spectacle that has become a "must" on tourist itineraries. The Coroni Swamp is around an hour's drive from the Asa Wright Centre. The swamp boats depart around 5pm, so we had to cross the Port-of-Spain area rush hour. What a difference from Tobago, where a traffic jam seldom involves more than a dozen vehicles. Fortunately, Newton's knowledge is not confined to birds; he simply took to the back streets and avoided the worst of the traffic, allowing us to also see a side of Trinidad we would otherwise have missed. There are several boat operators offering tours into the Coroni Swamp. Newton obviously knows the best. Tourists often fall prey to the more aggressive marketing techniques of the largest operator. However, Newton prefers a smaller operator, which meant a less packed boat. The swamp is a maze of channels – some natural and some dredged. It's not surprising that you can't hire a boat and just head out there yourself – you could so easily get lost. However, the boat captains operate tour every day so know the waterways intimately. Although Scarlet Ibis might be the focus of the trip, there is a vast amount of wildlife in the mangroves and once again, the combined eyes of our guide and Newton were of benefit to everyone. No sooner had we stepped on board than a party of serious birders recognised Newton and sought his comment and advice. So, even though we were supposed to be on a private day out, it ended up with Newton working as hard as ever. Mind you, he would argue that it wasn't work. He is so passionate about the subject that even on his days off you will probably find him out in the rainforest with his scope. Within minutes of leaving the jetty we saw our first wildlife – a 5-6ft tree boa, sleeping in the branches of an overhanging mangrove, immediately above the boat. I would like to say that the screams of the ladies scared away all wildlife within many hundred metres. I can't – it was the screams of the men. I'm only joking; the party were surprisingly self-contained. I think the boa's total impassivity convinced everyone that it couldn't care less about our presence. The beauty of the Northern Range and Arima Valley are hard acts to follow, but the Caroni Swamp has a beauty of its own. I just wish that electric boats could be used. The rattle of an outboard motor simply doesn't do it justice – not to mention the ecological aspects of the smoky exhausts. After a leisurely 30-minute cruise through the waterways, with Newton and our captain/guide pointing out a wide collection of bird species, we eventually arrived at a large area of open water. Surrounded by mangroves on all sides and featuring several islands and mud flats, this 'lake' was clearly somewhere special. Making our way across the water, we moored beside four other tour boats, facing a mangrove-covered island backed by the hills of Trinidad's Northern Range. Once the engines were switched off, it became a spot of wonderful peace and solitude. Six o' clock was rapidly approaching and the light was starting to fade. Fortunately, one group of birders on our boat had come well prepared. No, I'm not talking about telescopes and long lens, I'm talking about a cool box and liberal supply of rum punch. What generous people! 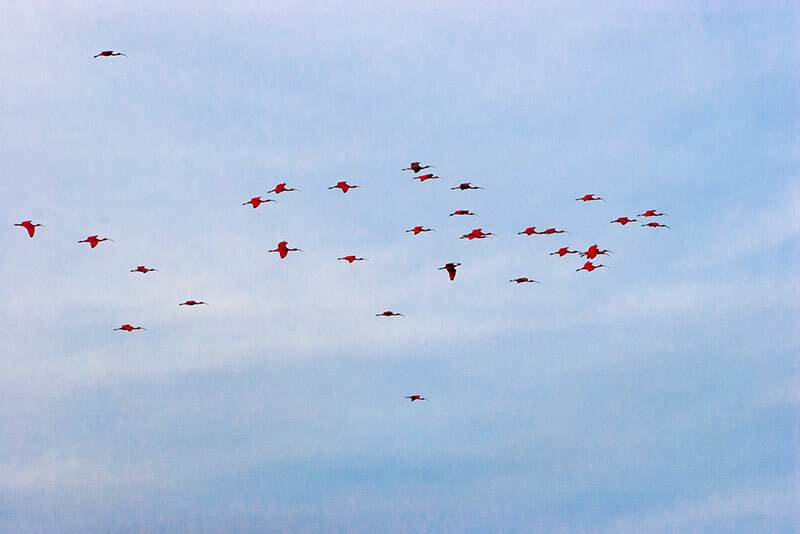 No sooner was it down the hatch than excited calls from one of the boats announced the arrival of the first flock of Scarlet Ibis. There may have only been half a dozen, but it was still a magical sight. Rather than settling down to roost in the mangroves, the Ibis landed on one of the sandbanks near the central island, where a dozen or so egrets were already feeding. Within a few minutes another flock arrived. Slowly, the pace picked up. As did the flock size. Within ten to fifteen minutes it was a continuous procession of birds, with flock sizes of fifty to a hundred birds. I have no idea what was so special about that central island? 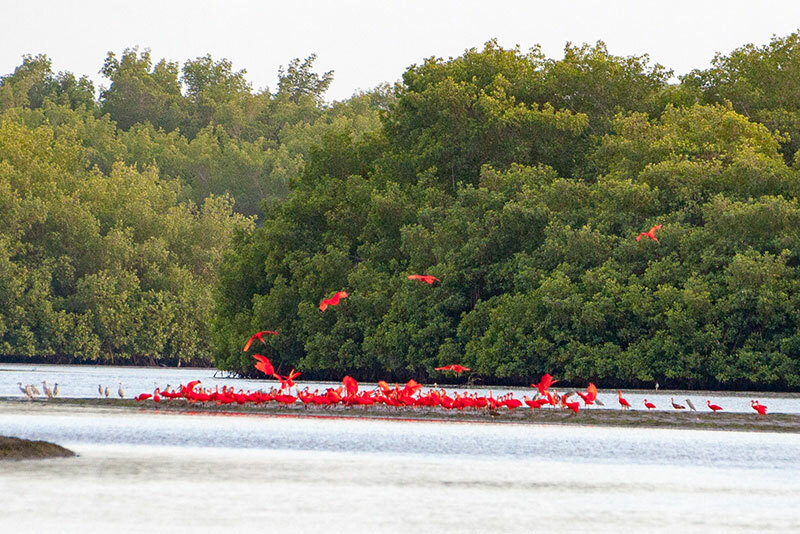 Most of the birds landed there, turning the green of the mangroves scarlet red. The juvenile Scarlet Ibis are black in colour. The scarlet colouring, which comes from the diet of crabs and other crustaceans, only comes when the birds have matured at two years of age. The colouring gets darker as the bird gets older. All the early arrivals were mature adult males. As the procession progressed, a few juveniles could be seen amongst the adults. By the end, juveniles represented the majority; clearly not strong enough to keep up with the adults. As suddenly as it had started, the spectacle came to an end. Light was fading fast and the tour boats started up, cast off and headed back into the narrow channels of the mangroves. A journey that had taken a 30-40 minutes outbound became just 10 minutes or so on the return, showing how one has no sense of direction or perspective in the waterways. One thing that particularly surprised me about the tour was the fact that we weren't the least troubled by mosquitoes. I had imagined that they would be a real problem in the swamp and so we had come well prepared. However, I didn't notice other people constantly swatting or complaining, so even those who had not sprayed their arms and legs with a good deterrent seemed unaffected by the blighters. Hopefully our experience was typical, but I feel it wise to say that visitors should go prepared. By the time we got back to the vehicle and hit the road, night had fallen. It had been a long day and I was frankly glad that it was only a short 20-minute journey back to Piarco airport. Shortly after 9pm we arrived back at the Blue Haven Hotel. Although tiring, it was a truly wonderful day and would not hesitate to do it again. We can strongly recommend this tour. Trinidad is not a place for the "do it yourself" tourist and therefore I can only recommend trips to Trinidad when accompanied by an experienced guide. Although local guides were provided at both the Asa Wright Centre and the Caroni Lagoon National Park, having Newton with us considerably enhanced the day and removed all the hassle. It was literally a matter of sitting back and enjoying it. This remarkable hotel is located on the fringes of the rainforest reserve, in the very centre of the island. The hotel is worth a visit just to experience the beautiful 3-mile winding trail (recently surfaced) through the rainforest to the ex-cocoa plantation on which the hotel stands. The hotel has 12 superbly comfortable rooms and is owned and managed by the indomitable Regina Dumas, who oversees all the catering and produces the best Caribbean cuisine you are likely to experience. The bird life here is nothing short of spectacular, so it is not surprising that the Cuffie River is the first choice of many specialist bird tours. Full details, including our personal, are available in the Accommodation listings. Our review video offers a glimpse of the birding opportunities available. Located near Speyside, on Tobago northeastern Atlantic coast, the Blue Waters Inn has been one of our favourite small hotels for many years. The birdwatching opportunities here are totally different to the Cuffie River. In fact, the ideal itinerary would be to enjoy a few days at the Blue Waters Inn, where you will be able to snorkel on Angel Reef and enjoy a trip to the Little Tobago wildlife reserve, followed by a few days at the Cuffie River Nature Retreat, where the birdlife and catering are likely to leave you fully satiated. Birds of Trinidad and Tobago (Helm Field Guides) [2nd Edition], by Martyn Kenefick, Robin L.Restall and Floyd Hayes. This is the number one bird book used by birders visiting Tobago. All the photos and a handy pocket size suitable for field trips. Birds of Trinidad and Tobago [3rd Edition] by Richard Ffrench. Once the definitive field guide for birders on Tobago, this guide is still a favourite choice with many visiting birders. 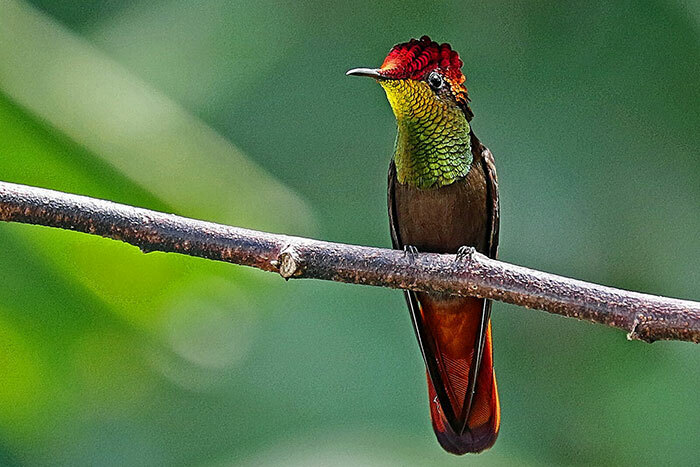 A Birdwatchers Guide to Trinidad and Tobago, by William L.Murphy. With over 25 years experience birding in Trinidad and Tobago, Bill Murphy is undoubtedly a true expert on the subject. His book is supplemented by a useful website (www.TrinidadBirding.com). The book is somewhat outdated now, but still considered a useful reference guide. Birding Tobago ... Jacamars, Jacobins & Johnny Jump-Up by Malcolm Rymer. Undoubtedly the best birding video of its kind. The author has now retired, but the videos are still available on DVD from Newton George [email now]. Fatbirder www.fatbirder.com: A great resource for enthusiastic birders. 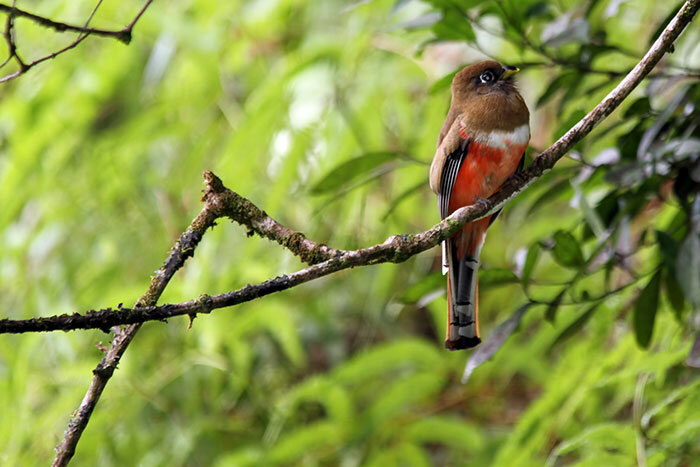 A huge site covering birding around the world, with Fatbirder report on Trinidad & Tobago. Trinidad and Tobago Rare Bird Committee rbc.ttfnc.org: The TTRBC maintains an official list of the bird species of Trinidad and Tobago. Discovering the Birds of Trinidad and Tobago www.birdsoftt.com: a useful local site by Brian Ramsey. A useful supplement for international birders visiting Tobago.